The 2016 Chamber Golf Outing first place team was David DaRif, Jerry Mount, Mark Heiny and Brad Patton. Whitney Gentry presents the Roberts Funeral Home “Dead Last Award” to Debbie Lentz, representing the team of Rick and Debbie Lentz, Brent Marshall and Andy Lachat. 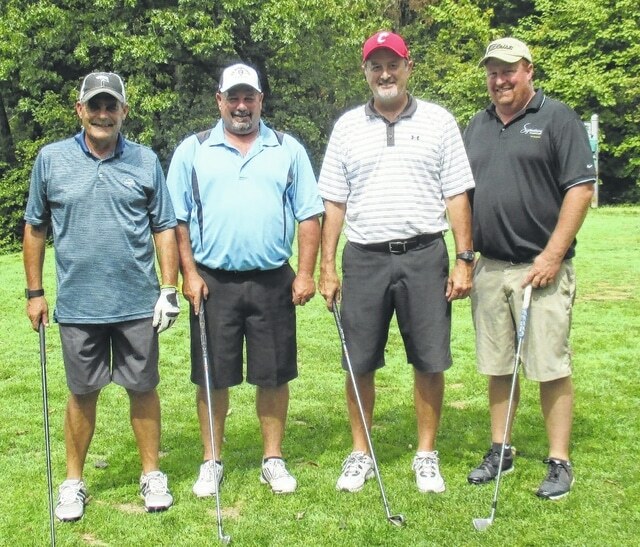 Buckeye Hills Country Club played host to the recent Fayette County Chamber of Commerce Scholarship Golf Outing where 14 teams engaged in some friendly competition for a good cause. The day started with lunch and the golf ball drop. Miami Trace Local Schools provided the bucket truck and dropped the hundreds of numbered golf balls onto the green. Three lucky winners took home cash prizes – Colt Sever, Larry Lyons and Gail Robinson. Golfers enjoyed a few games on the course and visited with a few hole sponsors who participated. Drink cart sponsors this year were St. Catherine’s of Washington Court House and Court House Manor. Men’s proximity awards were provided by East Ambulance while the women’s awards were donated by Tanger Outlets Jeffersonville. First place in the outing went to the team of Mark Heiny, David DaRif, Brad Patton, and Jerry Mount with a score of 57. Second place, with a score of 60, was the team from First State Bank, Mark Richards, Mike Pell, Tom Kizer and Judd Johnson. A new award was added this year for the team who didn’t fare quite as well as the others. The “Dead Last Award,” sponsored by Roberts Funeral Home, went to the team of Rick and Debbie Lentz, Brent Marshall and Andy Lachat. Proceeds from the event will be used to provide scholarships to students at Miami Trace Local Schools, Washington Court House City Schools, Fayette Christian School and Southern State Community College. This year’s outing raised over $4,000. For more information about the Fayette County Chamber of Commerce, call 740-335-0761.
https://www.recordherald.com/wp-content/uploads/sites/27/2016/09/web1_20161stPattonHeinyMount.jpgThe 2016 Chamber Golf Outing first place team was David DaRif, Jerry Mount, Mark Heiny and Brad Patton. 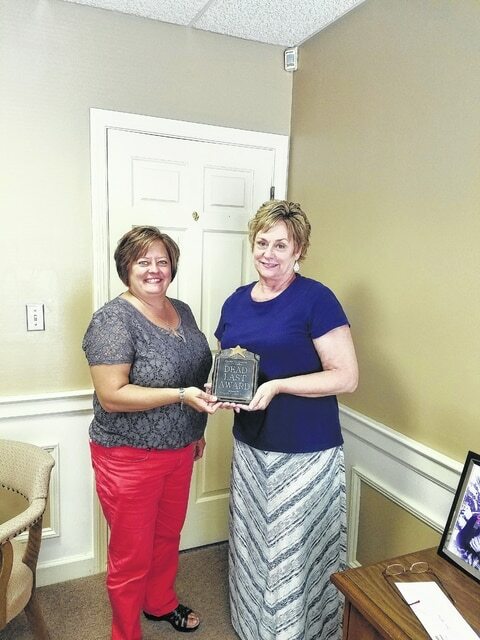 https://www.recordherald.com/wp-content/uploads/sites/27/2016/09/web1_2016-Dead-Last-team.jpgWhitney Gentry presents the Roberts Funeral Home “Dead Last Award” to Debbie Lentz, representing the team of Rick and Debbie Lentz, Brent Marshall and Andy Lachat.